Filled with photographs, illustrations, storyboards, and other artwork, Star Wars: Stormtroopers comes complete with removable features - such as a concept sketch, comic strip, replica memorabilia, and more - making it an essential keepsake for every Star Wars fan. Discover how these instantly recognisable troopers have transcended the screen to become a universal symbol of Star Wars. Back in 1977, I was seven years old. For my eighth birthday, one of the kids that attended my party gave me a Palitoy Star Wars Hammerhead action figure. I had no idea what it was, and I hadn't seen Star Wars. He also gave me some packets of Star Wars bubblegum trading cards. One of the cards featured a picture of stormtroopers. I didn't know what they were, but I was fascinated by them. When we went out shopping next I spotted a stormtrooper action figure, and it ended up being the first one I bought with my own money. I grew up, left my childhood behind and through the course of my work I ended up chatting with an American designer. Over lunch, talk moved to hobbies and I discovered he was a huge Star Wars fan who also collected Star Wars themed helmets. I showed an interest in stormtroopers, said that the eight year old me would have loved a stormtrooper helmet... and then several weeks later a parcel arrived for me at the office. Inside was a replica stormtrooper helmet. It brought back waves of nostalgia and since then I've sort of fallen in love with the idea of movie replica costumes and props. Star Wars: Stormtroopers is a book that could pretty much have been designed especially for me, and my American friend. It's a lovingly crafted love letter to stormtroopers. And, while it does mainly focus on the iconic original troopers, it opens the net wide to also feature other variants that are based on the originals. The book opens with a foreword by John Boyega, who as Finn, is the franchises current face of the stormtroopers. And goes on to cover just about everything you could ever want to know about The Empire's elite soldiers (which for some reason can't shoot very well). From their original design and costume construction, right through to how they've embedded themselves in pop culture. It explores merchandise and collectables as well as the charitable contribution the 501st Legion of fan cosplayers (I apologise if that's not the correct term) have made. The design offers the occasional fold out page as well as a number of cool reproductions. 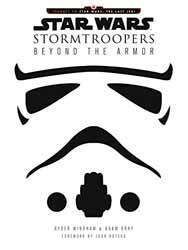 Of particular interest to me was the reproduction of the Kenner stormtrooper action figure backer card; a reproduction of a 1979 Star Wars comic strip; a reproduction of a storyboard from Return of the Jedi; a reproduction of the stormtrooper mask that came on Kellogg's C-3PO cereal boxes; and an early concept sketch for a trooper with a kilt. Apparently you can also download this as an eBook... but who on earth would want to do that? This is an essential purchase for all die hard Star Wars fans.